celebrated her 70th birthday on Sunday in her native Athea with her family & friends. The next Ladies Monthly night out will take place on Friday, May 3rd at Brown Joe’s at 9.30pm. This will be a fundraiser for the Lourdes Fund. All the usual games, quiz, bingo and fun. Your support would be appreciated. Thanks to everyone who has purchased tickets for the fashion show to date which takes place on Wednesday night, April 17th at 8pm. Your support is much appreciated. There are a limited number of tickets still available at Collins Shop, O’Riordan’s Pharmacy, Kathleen Hairdressers and Athea Credit Union. Some tickets will also be available on the door . The fashion show has rightly become one of the highlight events of the year in Athea, don’t miss it! Our parish will again take part in the Team Limerick Clean up on Good Friday. Supplies will be made available at the Con Colbert Memorial Hall on Friday morning at 9am. There are limited litter pickers available so we are appealing to anyone who received litter pickers last year to please bring them along. All litter pickers handed out this year will need to be returned to Athea Tidy Towns and put in storage for next year. This is a great opportunity to clean the roadsides of the parish and everyone is invited to take part. Many thanks to John Scanlon who has been busy the last number of weeks erecting the heritage trail plaques. All 20 plaques are now in place and we are currently working on the map to accompany the heritage trail. Jim Dunn is busy at the moment repairing the mural which we hope to have ready to display for the fleadh weekend. We are forever grateful to Jim for his dedication towards improving our streetscape and sharing his talent with us. The three benches at the Graveyard were erected last week. These benches were purchased with funding made available from Limerick City & County Council through the Community Enhancement Programme. Thanks to the Fás boys for preparing the foundations for the benches. The benches suitably bare the following inscriptions: 1 Those we love don’t go away, they walk beside us everyday 2. Death leaves a heartache no one can heal, love leaves a memory no one can steal 3. Go luí mé le Dia ‘s go luí Dia liom’. The Athea Craft group have been busy the past number of weeks painting stones which will be placed in the Fairy Garden. These will add a colourful element to the trail. We are currently looking into ways to expand the story of the Giant which is very unique to Athea – the story has lots of potential for marketing Athea. Children’s Festivals, ‘Crowning the Tallest Person in Limerick – The Limerick Giant’ lots of possibilities! Incidentally, we have ordered the entry signage for each road thanks to funding made available from Councillor John Sheahan through his GMA allocation. These signs will bare the following inscription – Fáilte go Áth an tSléibhe – ATHEA – The Giant’s Village and will be suitably painted in the maroon and white of Athea. Looking back over the years, we have been blessed in this area by the amount of talented poets and writers that lived amongst us. Through their songs and verses they recorded for us all the happenings of the times. In earlier times it was the custom to make up songs in praise of local landlords. This was a kind of two way street because the landlords often gave financial support to ensure they got a good review. Wars and local battles were recorded as well as sporting successes and other notable events. Poets could be cruel as well and had no problem ridiculing those they didn’t like in verse. In later years emigration gave them plenty scope to highlight the loss and sorrow felt by those who had to stay behind while their families left for foreign shores to try and make a living. Unlike today, it took over 24 hours to get to England and weeks to get to America or Australia so some of those taking the ship were unlikely ever to be seen again. That is why they had the “American Wake”. Our parish was decimated during the first half of the last century due to the lack of employment. Not a house in the local townlands was spared. The poets and rhymers told us of those leaving their native homes and these songs were sung at rambling houses and gatherings and were especially popular with those who had emigrated. A song about home brought a tear to the eye of many a hardened navvy in the pubs of London, Birmingham and the likes. Love stories were also popular especially those about unrequited love. No occasion was spared and we now have a wealth of material that gives us a snap shot of life at a particular time in this area. There were poets in every townland. I could count five alone in Knocknaboul. Some were better than others but it is wrong to be critical of people who had only basic education and had the courage to take the pen in hand. But, times change and with the passing of Pat Brosnan, Paddy Faley and Dan Keane, in recent years we have seen the last of the poets. There aren’t any young people following in their footsteps, more’s the pity and we are the poorer for that. With the advent of social media, writing has changed completely. Pen and paper are gone and we communicate through facebook, Instagram etc. The art of writing is dying with abbreviations that are used in text messages. I was looking at a message on a youngster’s phone the other day and she had to explain much of the terminology to me. I suppose we can call it progress and it is just another way of communicating which is the really important thing but I miss the old writing that we learned at school. Each person had a distinctive style of handwriting, some more legible than others. My own writing was appalling. When I started in secondary school in Abbeyfeale, the head master, Jim Kelly, on looking at my first English essay said: “ I hope you have leanings towards the medical profession, Mr. Barry, because that is the only place your writing will make sense” Even today I have problems reading my own writing never mind expecting any one else to do so. Some people though had beautiful hands. I have examples of handwriting by the late Maighreád McGrath and, even when she was in the latter part of her life, it was beautiful to behold. Although perfectly legible, it had a flourish that an artist would be proud of. She wasn’t the only one to possess such qualities but alas I fear we will see it no more. Much of what we learned about grammar is now also obsolete. Our language is now influenced mainly by television and the worst of American TV in particular. It drives me around the bend when I hear our own presenters referring to everyone as “guys”. People say things like “I am so not going to do that” I could go on with more examples but I fear that I am a bit like King Canute trying to keep back the tide. Our rural accents are in decline. You wouldn’t know now if a person came from Connemara or Wexford, especially females. There is some light at the end of the tunnel however. Some young people are composing songs and while most of them are utter rubbish there are one or two who show great poetic ability. I am thinking of people like Ed Sheeran who have the ability to string a few verses together. We can only live in hope that the day of the poet is not gone completely and that they will develop through the modern media. Well the first draw of ‘Split the Bucket’ (in aid of the Lourdes Volunteers and Invalids travelling in June) took place on Saturday night in the Sacristy with the committee. Maedbh O’Donovan, one of the volunteers travelling, drew the winning ticket and the lucky winner of €100 was Bibi Gleeson of Upper Athea who we congratulate. The next draw will be on Saturday 27th. Buckets are again placed in all the usual outlets so to be in with a chance drop your €2 in the envelope provided, add your name and phone number and who knows you may be the lucky winner. We thank sincerely all those who have supported the cause, also those who threw in their loose change and those who gave notes instead of the €2, it’s very much appreciated and we will think of you all in Lourdes, when we light the special candle for the Athea people. Thanks also to Agatha Barrett who did great work at the Athea Bingo to help with our fundraising. 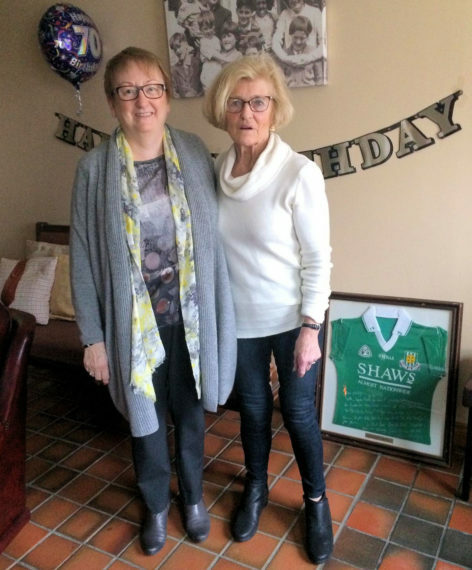 Congrats and best wishes go to Joannie McGurk (nee White – formerly of Colbert St.) who travelled home to celebrate her 70th birthday from the U.S.A. Last week. Her sister Betty and brother Tom also travelled from England for the occasion. They celebrated at home with sister Brownie and friends. Here’s to many more years of health and happiness to Joannie and safe trip back to the U.S.A.
Don’t forget the much looked-forward to Fashion Show on Wednesday night, a fundraiser for the Tidy Towns who do Trojan work in and around Athea. The big Limerick Clean-Up takes place as always on Good Friday, so you are asked to put on those gloves, get your bags and help along your own stretch of road or wherever. On Saturday I even brought a shopping bag of mostly “recyclable” rubbish which had been conveniently “hung on a branch” up the road – what is wrong with these people? Actually it’s a pity there’s no electricity supply on the ditch, as there’s a microwave thrown in over the blessed well! Congrats and best wishes are extended to Stephen McEnery, Hillside Drive (son of Angela and Denis) who celebrated his 30th birthday on Saturday night last along with family and friends at the Top of the Town. A great night was had by all. Wishing everyone all the very best for a very ‘Happy Easter’ and by all accounts the weather is meant to improve this coming week. May God give you all the faith it takes to make your dreams come true. It seems no time at all since we were preparing for Christmas and yet, here we are, preparing for Easter. It is good to hear that we may have a fine weekend to look forward to as last weekend was so cold and bitter. Sun 21 –Kilteery Dawn Mass at 5.30am. 10 am in Loughill and 11 am in Bally. The Knockdown Vintage committee will make a presentation to a representative of The Children’s Ark Foundation U.H.L on Saturday April 27th in the Knockdown Arms. All welcome. I wish to extend a very special Welcome Home to Maggie Eileen Mulvihill who will be my new neighbour. Congratulations to her parents Kim and Thomas Mulvihill, her proud grandparents Marcella and Tom and her even prouder great-grandfather Jack O’Grady. We wish them a lifetime of happiness. Maggie is the first baby born into the O’Grady house since Noel was born in 1967 (I think). Peg, R.I.P. would be happy that a new generation is being born – and that her name continues in Maggie. I wish a very happy Easter to all readers and fellow correspondents. Copyright © 1996-2018 Athea & District Notes. All rights reserved.